Rachel Von | The Journal Gazette Saint Francis' Chandler White, right, tries to shoot the ball over Mount Vernon's Jevon Knox during the first period of the game at the University of Saint Francis on Saturday. Rachel Von | The Journal Gazette Mount Vernon's Jacob Paul, left, and Saint Francis' Austin Compton fight for the ball during the first period of the game at the University of Saint Francis on Saturday. Rachel Von | The Journal Gazette Mount Vernon's Alex Johnson, right,tries to stop Saint Francis' Connor Lautzenheiser from getting to the hoop the first period of the game at the University of Saint Francis on Saturday. Rachel Von | The Journal Gazette Saint Francis' Derek Hinen dribbles the ball to close to the hoop during the first period of the game at the University of Saint Francis on Saturday. Rachel Von | The Journal Gazette Saint Francis' Devon Tennant, left, tries to find a way past Mount Vernon's Brett Vipperman during the first period of the game at the University of Saint Francis on Saturday. 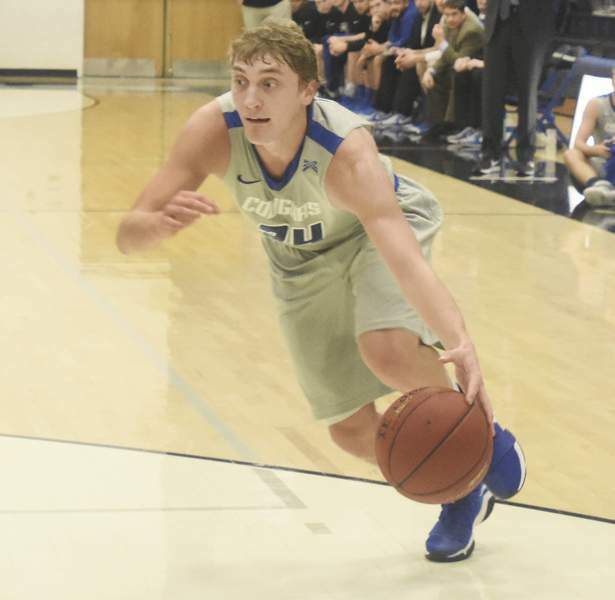 Saint Francis didn’t always have its best stuff Saturday afternoon, but its grit was unquestionable as the third-ranked Cougars powered through to a 77-70 victory over Mt. Vernon Nazarene in front of 1,031 fans at the Hutzell Center. 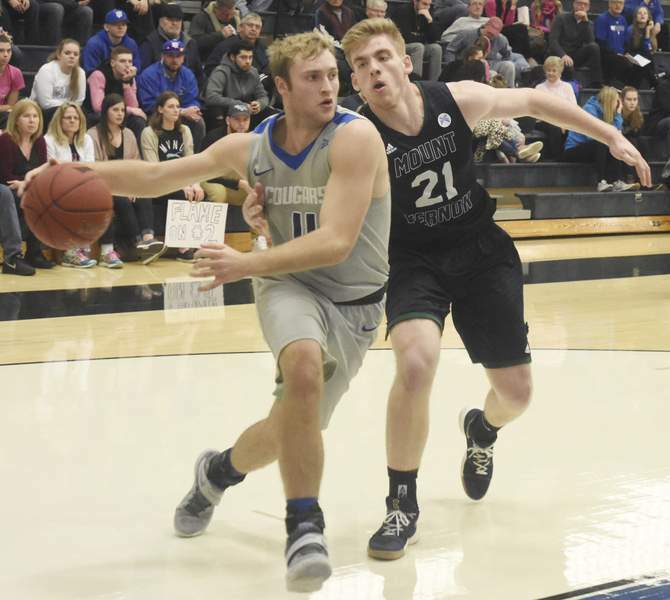 Chandler White and Connor Lautzenheiser, who came in as Saint Francis’ third- and fourth-leading scorers respectively, showed the team’s depth. White, a junior out of Carroll, had 22 points and spearheaded a decisive second-half run, while Lautzenheiser, a sophomore, had 21 points. 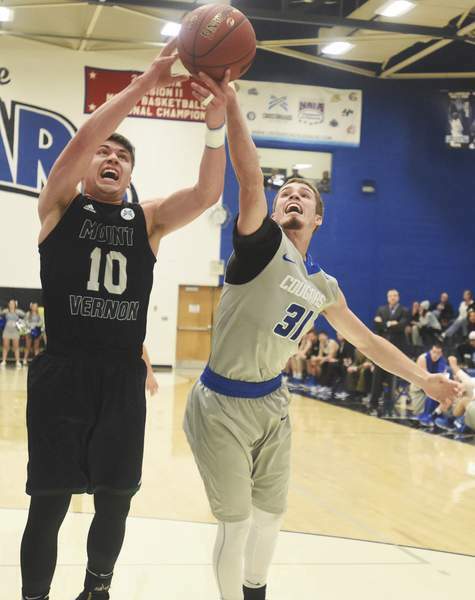 “It was nice to see those two guys play big for us,” said coach Chad LaCross, whose Cougars (20-4, 10-2 Crossroads League) recovered from Tuesday’s 83-74 loss to Marian and won for the 19th time in the last 21 games. Saint Francis is 14-1 all-time against Mt. Vernon Nazarene. “I thought it was a good win, a good team win for us. Any time you can grind one out, it’s important, especially this time of year. I feel like offensively we might be in a little bit of a funk right now, but we were still able to get the (victory), so that’s important,” said LaCross, who didn’t like the ball movement or offensive aggressiveness of his team in the first half. Things began turning in Saint Francis’ favor with 15:32 remaining, when White went hard to the basket for a 42-41 lead after Bryce Lienhoop's pass. That kicked off a 14-3 run that included seven points by White, who overall was 4 of 7 from the field, made 14 of 16 free throws and had five rebounds. Saint Francis took a 59-48 lead when Lienhoop fought off a double team underneath the basket to send a pass to Lautzenheiser for a 3-pointer from the corner with 9:25 remaining. Mt. 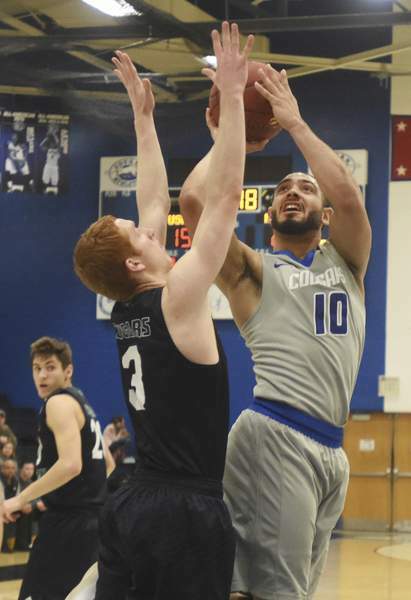 Vernon Nazarene cut the deficit to 67-64 on a Jevon Knox jump shot with 1:38 remaining, but Lienhoop answered with a pair of free throws and then Saint Francis forced a turnover to thwart the comeback. Lienhoop had 11 points and seven rebounds after he came in averaging a team-best 17 points. 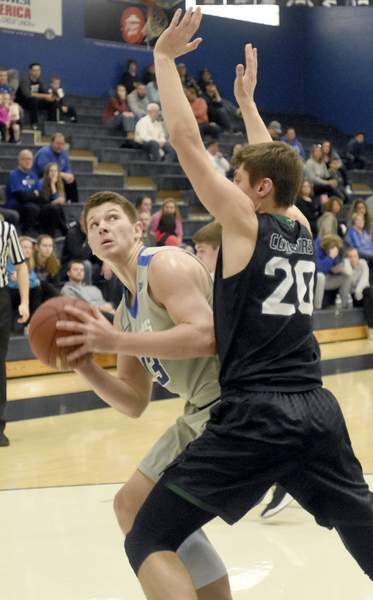 Derek Hinen, who had been averaging 16.9 points, had only seven points, while Evan Henry had eight. “Today, Derek didn’t play well, but me and Connor kind of picked him up. Bryce struggled with foul trouble – he had four fouls – but we all just pick each other up and that’s a big reason why we’re so good; it’s because we’re so deep,” White said. No. 33 Mt. Vernon Nazarene (14-10, 6-6) was led by Jeremiah Roberts’ 18 points.